Ozzy Bubbles is rated 5.0 out of 5 by 5. Rated 5 out of 5 by 16paws from Just Like Old Times! 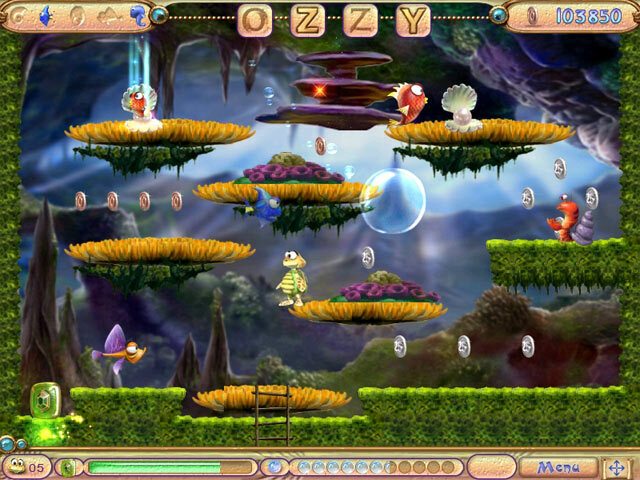 Ozzy Bubbles is just like the old time platform games I used to play. 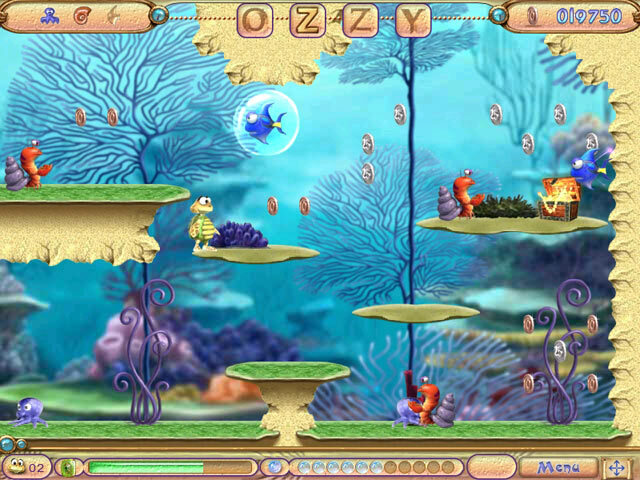 There are other platform games offered at Big Fish, but Ozzy can do more than jump on monster fish - he can shoot them with bubbles, which makes it much more exciting. All sorts of bonuses appear to help out: high jump, triple bubbles, immunity, power ups, and many others. The first few levels could be considered training levels, to practice jumping and shooting, earn extra lives and study enemy movements and tactics.. 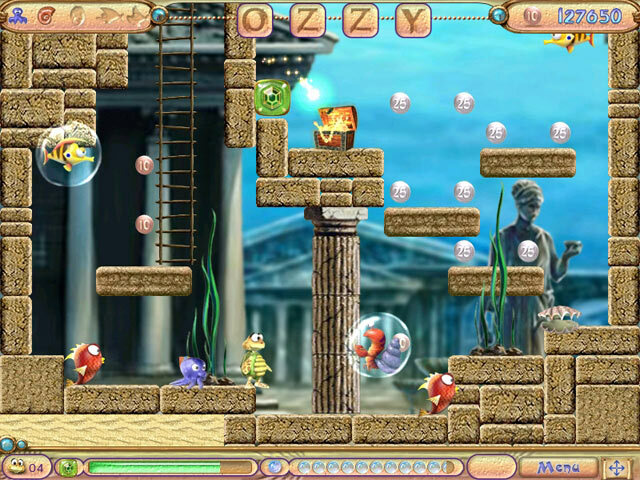 I would really love to see more run, jump and shoot games like Ozzy Bubbles! Playing this game was so much fun that I immediately started over from the beginning and played it all the way through a second time. Rated 5 out of 5 by kua2u from I love it Ozzy rocks! He blows enemies out of the water! And the enemies keep getting meaner as he goes along. Sometimes there are hidden ponds==that's fun to find. 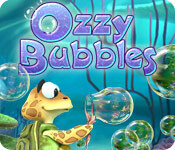 I want MORE Ozzy Bubble games! Rated 5 out of 5 by baughmarla from FUN FUN FUN DIVE INTO THIS GAME FOR FUN Bubble Bubble here i come to meet the trouble!!!. I really had fun with this game. Jumping, back and forth around and up and down. Don't get caught by the bad fish and meet the challenge. Just stomp them. Poww!! Take your mind off things and have fun. I liked it. Though it is quite unusual for me to play this type of game, i did enjoy it and had fun. Easy, tricky,cute and funny. I just might put this one in my list. It is great for all. Change is healthy.Treasure chests of gold, lots of rewards, don't need hints or stuff like that there with ths. Special power ups,flying high, colorful action. Surprise attacks, but reap rewards with the kill. Better than shooting chickens. This is just plain fun. I wanted to see what the end was but need to buy to get the secret. Family fun taking turns on the levels, and so easy to do with the mouse. Try it U WILL like it. :) I like everything. :) You won't want to stop til you get to the end. What is there?? Rated 5 out of 5 by Heartofngapuhi from Here we go Again. Many people I told about this game didn't realise there is actually 3 games with this same central character wether this is the first or third or whatever doesn't matter because it is definitely a lot more enjoyable than the other two combined.